The Explorer's Club is a private club that began in Manhattan in 1904. Since its inception members have included everyone from explorers like Charles Lindbergh and Neil Armstrong to presidents like Franklin Roosevelt and Herbert Hoover. The club, which is housed in an old mansion on the Upper East Side, features an impressive rare book library (containing over 15,000 books on exploration and travel), as well exotic artifacts from expeditions that have taken place as far away as the moon. Since 2009, Lorie Karnath has presided over the club as president, traveling the world and setting up programs that help foster creativity, discovery and science. She has led several Explorer's Club Flag Expeditions, covering some of the Earth’s most remote locations in search of answers to the world’s most immediate environmental concerns. "I love Mr. Chow on 57th street. I stop there just to get a little bit of my Asia fix from time to time." "This is, of course, one of my favorite museums. When you can’t hop on a plane and get to the Borneo jungles or elsewhere, the Natural History Museum is a good place to stop." 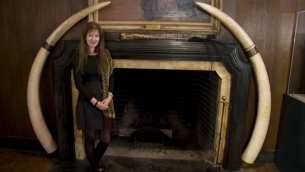 "I love the Asia Society that’s right near the Explorers Club. They have very impressive exhibits. I’m very involved in Asian art overall so I just love the building." "This library has always been my extra special favorite. When I was in University I studied early Christian manuscripts. They have an amazing selection of illuminated manuscripts and they always have excellent exhibits." "This is a wonderful Italian restaurant on West 13th and the owner is from Bologna." "I love The Place on West 4th street. It's a wonderful restaurant with great American and Pan European food. The atmosphere is really cozy and inviting." "This is one of my favorite places. I love the celestial depictions on the ceiling and the fact that you’re looking at it as though you're above not below. This is because they copied the medieval maps where you were looking at it as if you were looking through another ethereal body." "Underneath the station is the whispering wall where there's these ceramic arches that if you stand in one corner the sound travels along the arch and you can hear it louder than if someone was standing right next to you. It's so cool." "There’s a number of fantastic statues, but there’s one I especially like, this malamute dog named “Balto". He helped rescue Alaskans by bringing them needed medication when diphtheria broke out and he was the lead dog who got there fastest and saved hundreds of lives." Lorie your beautiful....how do i join..you should hear my travels.